Freeform's (formerly ABC Family) newest television adaptation of a best-selling young adult novel comes in the form of Shadowhunters. The show is based on the first book in Cassandra Clare's The Mortal Instruments series, City of Bones. Hollywood previously adapted this supernatural YA story of demons and angels in the 2013 film The Mortal Instruments: City of Bones. But, though the film was poised to be the next big YA franchise, it failed to live up to expectations both critically and financially. Now, The Mortal Instruments is getting a fresh start on the small screen in Shadowhunters, with the first episode 'The Mortal Cup' written by Ed Decter (In Plain Sight, Helix) and directed by McG (Chuck, Supernatural). The show follows Clary Fray (Katherine McNamara), who is suddenly thrust into a world of demons on her 18th birthday, and her mother Jocelyn (Maxim Roy) is kidnapped before she can give Clary any answers. 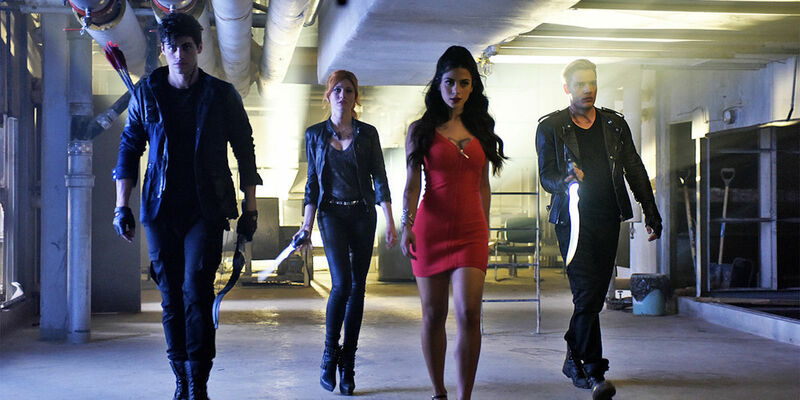 Unable to trust Jocelyn's friend Luke (Isaiah Mustafa), Clary turns to a group of demon fighters known as Shadowhunters -- Jace (Dominic Sherwood) as well as brother and sister Isabelle/Izzy (Emeraude Toubia) and Alec (Matthew Daddario) -- despite Clary's best friend Simon's (Alberto Rosende) protests. Even for a series premiere, 'The Mortal Cup' is tasked with an exceptional amount of world-building to include within a single episode. Not only does Shadowhunters need to explain the human-angel hybrid race the show is named for, there is a complex world simply consisting of Shadowhunters -- which include two factions, the evil Circle and the good Clave -- before other races of supernatural beings like demons, warlocks, vampires, and werewolves are even factored in. To the show's credit, Shadowhunters doesn't spend too much time on overly expositional dialogue, though there are certain instances toward the end of the episode when it becomes necessary. Plus, since the episode focuses on Clary entering this new world with as much (or perhaps even less, if viewers have read the book or seen the movie) knowledge of what's going on, she acts as a natural entry point to Shadowhunters' mythos. Still, as a result of so much world-building, the episode rushes through important moments too quickly at times without giving new viewers enough explanation as to why they're significant. For instance, fans of The Mortal Instruments will recognize and understand the meaning behind Luke's moment when he calms a barking dog, or when Clary's biscotti turns into a drawing. However, to viewers without previous knowledge of the books, these moments feel disconnected to the main storyline of the episode -- though given the weight and focus of these moments, fans perhaps understand they will take on greater importance later on. Given all the episode needs to accomplish, 'The Mortal Cup' does allow viewers to breathe every so often, focusing on the various relationships between the characters, such as Clary's bond with her mother and Luke, who has largely acted as an adoptive father of sorts, and her friendship with Simon. Of course, Shadowhunters strays into the stereotypical YA realm with an ongoing thread of Simon's unnoticed and unrequited feelings for Clary, who points out that Simon is unperceptive of his bandmate, Maureen's (Shailene Garrett), crush on him. Although Shadowhunters could easily fall into the tired love triangle cliche so often seen in the YA genre, 'The Mortal Cup' quickly sets it up and moves on without giving it too much focus. Another triangle established at the end of the episode is the one between Jace, Clary, and Simon. However, Shadowhunters manages to turn what could have been another tired trope into a physical representation of the choice Clary must make at the end of the episode: After learning about Shadowhunters and demons, will she deny this newfound knowledge and return to what's safe with Simon, or will she follow the path she's on and attempt to recover her mother with Jace? Although Shadowhunters is bound to continue exploring one love triangle or another, the added weight to Clary's choice between Jace and Simon within 'The Mortal Cup' certainly helps this YA trope to feel a little less cliche. Though there isn't much room for action within 'The Mortal Cup,' there are two set pieces that stand out: Jace, Izzy, and Alec's battle at the club -- which has the name of Pandemonium that is only forgivable because it's owned by the warlock Magnus Bane (Harry Shum, Jr) -- and Jocelyn's fight against Circle members. The visual and sound effects of the Shadowhunters' swords, known as Seraph blades, give both fight scenes an interesting element, setting them apart from other action seen on television. With the added effect of the demons being destroyed, the skirmish in the club between Jace, Alec, and Izzy, who also uses a whip in the fight, especially becomes a visually entertaining spectacle as well as an exciting action set piece. But, at the heart of the Shadowhunters is Clary, portrayed well by McNamara, who manages to bring both the lightness to the carefree 18-year-old as well as the depth to the daughter searching for her kidnapped mother. Rosende also effectively stands out as Simon, who surpasses the role of the lovesick best friend. Although many of the other performances help to elevate the show, certain characters aren't executed as well -- specifically Mustafa as Luke and Toubia as Izzy, both of whom come off more as caricatures than real people within the supernatural world of Shadowhunters. Still, to their credit, 'The Mortal Cup' didn't give many of the supporting characters much to work with aside from McNamara, Rosende, Sherwood as Jace, and Roy as Jocelyn, so the actors may fall into their roles more comfortably as the series progresses. By the end of the episode, 'The Mortal Cup' is meant to either effectively introduce new viewers to the world of Shadowhunters, or give fans of The Mortal Instruments a reason to watch another adaptation of City of Bones. All in all, the episode is successful in both respects, offering an exciting crash course to the world of demons, starting immediately with the slick opening scene -- one that fans of McG will surely recognize as displaying his signature style -- and hooking viewers through mostly compelling character performances by a cast made up largely of newcomers. Shadowhunters is a fun supernatural YA adaptation with a premiere episode that teases plenty of emotional ground to cover and an entire mythology to explore. Now it simply remains to be seen if Shadowhunters is able to deliver on everything 'The Mortal Cup' set up for its first season.